When people on the street meet our dogs, they frequently comment on how thin they are. Some even ask, “Are you sure they aren’t too skinny?” with this look of disgust on their face which says, “You’re cruel for starving your dogs”. Many people, and even some veterinarians, don’t know what an Italian Greyhound should look like. Most vets are used to labs and other breeds which are meant to look stockier than our svelt IGs. We’ve had some adopters tell us their vet thinks their IG is too skinny, when the dog is at a perfect weight for an IG. Simon – at his ideal weight. Simon has a nice tuck up and in person you can see a trace of one or two ribs. In Wisconsin, we are known for our brats and cheese lifestyles, but we all know being fat is not healthy. Canine obesity is the number one health problem in dogs today. According to a study by Imperial College London, Nestlé Research Center (NRC) and Nestlé-Purina, dogs lived on average 1.8 years longer on a low calorie diet. See the study for more information. Considering your Italian Greyhound will probably live on average only 12-15 years, 1.8 years is a big difference. As your dog ages, you’ll be glad to have those extra years. If keeping your dog slim will not only make them healthier and happier, but will also add a couple years to their life, why wouldn’t you keep them slim? 1 extra pound on a 10 pound dog is equal to 15 extra pounds on a 150 pound person. A couple pounds of extra fat on an IG is like an average person being almost 30 lbs overweight. WIth IGs, even a few extra pounds can make the difference between slim and obese. Also, due to their fine bone structure and thin legs, iggies can’t handle the extra weight. Keeping your IG a healthy weight is the first defense against leg breaks. 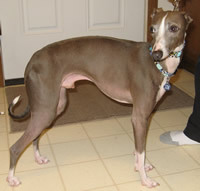 A healthy weight for an Italian Greyhound varies greatly with size. Small IGs could weigh as low as 6 lbs and very large IGs might be slim at 20 lbs. Average weight is usually around 12-14 lbs on an average sized Italian Greyhound. To determine what your dog’s healthy weight should be, you have to go by how they look. So what should a healthy IG look like? From the top down, they should not resemble a stuffed brat. They should have a smaller waist than rib cage and, speaking of the rib cage, you should see some of those ribs! When you can see ribs on a furry dog, it usually means they are too skinny, but IGs don’t have fur to hide those ribs. A good rule of thumb is, you should see a trace of the last three ribs. From the side, they should have a nice tuck up between their rib cage and belly. This is the shape that drew most of us to this breed in the first place. Don’t overfeed your dog so they lose the classic “IG look”. I’ve seen some IGs that are so fat they don’t even look like Italian Greyhounds anymore! A common place IGs gain weight is over their shoulders. I’ve had a couple fosters who arrived at our house fat and had extra weight on their bottom. Yes, IGs can have a fat booty and hips – and I’m talking about the here boys too. You should be able to see the ripples in the muscles on their legs and bottom. An Italian Greyhound is an athlete designed to run 35mph and your IG should look an Olympic sprinter – thin and well muscled. Rocky from the top down when he first came into rescue. Rocky used to resemble a stuffed brat and had rolls of fat on his shoulders. Rocky from the top down after he lost 2 pounds. Now you can see Rocky has a waist! So, you’ve read the above and realized Bella or Guido need to go on a diet, but how do you put a dog on a diet? The answer is easier than you think. Dogs can’t raid the refrigerator for ice cream in the middle of the night when nobody is looking. The number one cause of obesity in dogs is their owners. Some Misconceptions About How to Take Weight Off Your Dog. Getting another dog or hoping Bella or Guido will exercise or limit their food intake on their own is not the answer. While a fence is great to allow your dog the freedom to run when they want to, it is not going to force your IG to run. And a fat dog will not run that much. Rocky from side after losing weight. Rocky has a nice tuck up and in person you can see a trace of a couple ribs. “I feed Guido the amount the dog food bag says to. I don’t understand why she is overweight.” I’ve heard this many times. Remember dog food companies want you to feed as much as your dog will eat! They sell more food when you feed too much so they always the list the amount of food higher than your dog needs! Also, the amount a dog needs varies from dog to dog. Some pups are more laid back and expend less energy than a high strung dog. Don’t rely solely on the feeding amount the bag recommends. Use it as a guide and tweak the amount depending on your dog. A 1/2 cup two times a day might be the right amount for some IGs, but others might only need 1/4 cup two times a day. So far, I have not had a foster or owned an Italian Greyhound who needed more than a 1/2 cup of food twice a day. And I have had some big active boys who, at their ideal weight, were 18 or 19 pounds. Also remember, if you feed your dog a snack or treat between meals, you might need to cut back the amount of food you feed him in his next meal. Every bit of food counts. We always recommend not free feeding your dog. Free feeding is when you leave kibble out all day for your dog to snack on. The benefits of only offering your dog his food bowl once or twice a day are numerous enough to cover in a future article, but for weight loss, the benefit is obvious. You can control how much your dog is eating if you only offer your dog specific amounts of food twice a day. This benefit becomes even more obvious with more than one dog in your home. If you have more than one dog and you free feed, you can’t control their weight loss — at all! One dog might be fat and the other skinny because the fat one eats all the food. Dogs are domesticated wolves and wolves are used to binging and fasting. Wolves don’t have access to food 24-7. Sometimes they only eat a couple times a week. We shouldn’t expect our companion dogs to desire, or need, access to food constantly either. Offering them food twice a day, and not leaving kibble in their bowls to go stale, will please them just fine. A former foster when he first came into rescue. This IG was obese. But Bella or Guido gives you big puppy eyes or whines when hungry. The beg, they drool…they have you wrapped around their paws to do their bidding. This behavior can be changed! My dogs are fed twice a day and they never tell me when they want to eat. When they are fed is a decision they can make when they get a job and start doing the grocery shopping and cooking themselves! Dogs do what works. They are very much like us in this way. Dogs whine, so we do what works to stop the whining and give them supper a little early. Dogs want their supper, so they whine because it worked yesterday and you gave them food. It can be an endless cycle unless you, the human–and hopefully the smarter of the two–put an end to it. I’m not saying it will be easy. Dogs can take awhile to learn a new behavior, especially if the behavior has been rewarded time and time again for years. In their minds, if “whine = get food”, they are not going to stop whining for food very easily. But with consistent training, most behaviors can be altered. If your dog’s behavior is locational, for example, he goes to the kitchen and sits and whines for his meals, block the kitchen with a baby gate so he can’t. Many times, just by being a step or two ahead of the dog, you can put a stop to the learned behavior. One important thing to keep in mind is to make sure your dog looses weight slowly. I am not advocating starving your dog till he is back to his ideal weight. This can lead to other health issues. Cut back their food, but do it slowly. Losing weight takes time, but the end result is worth the journey. We all know to loose weight you should decrease calorie intake and increase calorie use. If your dog is a fat couch potato, get him out for frequent walks or jogs. Being skinny is not the end-all to being healthy. Fitness is a key ingredient to keeping the vet away! One vet put it best when he said “igs need about a minimum of 5 miles a week”. They need to get out, stretch their legs, sniff and see the world outside their house. This is good for them not only physically but mentally! Many cheap, commercial dog foods are loaded with fillers. Those added fillers, oftentimes grains, don’t help your dog stay trim. Feeding your dog a good quality kibble with more meat than grain will go a long way in keeping your dog slim. Just as humans lose weight on the Atkins diet, our dogs, being carnivores, are even more metabolically engineered to thrive on a high protein diet. My dogs only have grains on occasion and I never worry about them gaining weight. You are probably thinking you know what is coming: the usual dogs shouldn’t eat human foods mantra. However, this is a myth. Food is food, whether it is kibble, biscuit, cooked steak or raw apple. I am a firm believer that dogs should not subsist on only that so-called “100% complete” kibble diet. No animal naturally eats a 100% complete diet in every meal and even animal nutritionists paid the big bucks make mistakes when calculating what a 100% complete diet is for our dogs. When was the last time you balanced all your nutrients, vitamins and calories so you ate a 100% complete meal? My guess is, probably never. I’m a huge proponent of feeding your dog some healthy “human” or real food and of course cutting back their daily meals when they eat other food. Feeding human food will not teach them to beg unless you feed them from your plate. Feed them human food in their bowls or as training treats and they will not learn to beg at the dinner table. If you don’t teach them that begging from you will result in food in their bellies, they won’t do it. Dogs’ noses are many times more sensitive than ours and, trust me, they know your steak is going to be a lot better than their kibble. Even if they have never tasted it before. Smell is a big part of the ability to taste foods. Remember how food loses its taste when you have a stuffy nose? There are some human food dogs should never be fed. Onions, chocolate, grapes or raisins are out because these can make your dog very sick and even cause death, but other human foods can be good for them just like they’re good for you. If you have tried everything and your dog won’t loose weight, a trip to the vet might be in order. There are some health issues, like low thyroid, that can cause weight gain. But if your dog is otherwise healthy, only you are to blame for their extra pounds, and only you can fix the problem. Bella is not going to look in the mirror one day and decide she must go on the Atkins diet tomorrow so she looks good in her bikini next spring. Guido is not going to start working out at the gym so he can pick up chicks. However, you can look at Bella or Guido and decide they will be happier, healthier and live longer if they drop a few pounds, so you are going to slowly cut back their food and start exercising them daily to make this happen.